I remember quite a while ago I thought I was a serious small stream fly fisher. Way before I transitioned to tenkara. I was making bamboo fly rods and had been fishing my flys for many many years in the stream, river, lake and sea. At the time, I was at the top of my game and really enjoying it. I wanted to make a long split bamboo rod to fish our family farm ponds and maybe do a little fly fishing with and a fellow fly rod maker told me to contact Daniel at tenkarausa.com which I did and I got a rod from him. That first tenkara rod from a company in the United States no less sent me down another path, it totally derailed my fly fishing. Tenkara net making may be a good summer activity for kids. But, it’s probably best to start early because of the long drying period – though you can get away with a short drying. Our friend and tenkara enthusiast Aaron “Tye” shared a cool DIY idea for keeping track of your rod plug. He cut a small piece of bamboo, drilled the node off it, and reinforced one end with Kevlar cord. While we are working on a new system for preventing plug loss, this one is easy for anyone to do. Great ideas are usually the simplest and we really like this. It has always struck me as a bit funny to have mini rods made for the purpose of practicing casting (although I recognize it strikes a lot of people as funny to use no reels). Thing is, you can’t fish with practice casting rods, they are a toy. But I also recognize that most of us fly anglers also enjoy casting, and that we can always use a little practice to get more precise with our casting. When I was creating Tenkara USA I lived in a tiny studio apartment. As I was working a full-time job and working on TUSA on the side, often times I didn’t have time to go to the casting ponds near home during the day. I’d receive samples from our line maker and couldn’t wait to try them out. So, I’d get my tenkara rods, extend only a couple of segments out and get a feel for how they cast. The good ones I’d take out during my precious weekend fishing time. In fact, I didn’t realize it till this weekend, but there I had a perfect practice casting rod. This weekend Lance Gurney was helping out at our booth and at one point we talked about the practice rods our dealers were selling. He suggested making a mini practice tenkara rod. Winters can be pretty cold out in parts of the country and this could give the bored angler a diversion when he’s stuck inside. The line testing I did in my tiny apartment came to mind the moment he mentioned this. I proceeded to tell him that we didn’t need a toy for practicing casting. We had the perfect practice casting rod right there, just collapse a couple/few segments down, and voilà. To make it perfect, just fill the gap with a piece of folded paper/foam/etc. It is probably best to use the traditional tenkara line for this purpose as it is slightly heavier and more supple. So, whenever you get bored at home next time, or if you want to play this casting game, just pull out your tenkara rod, rig it up, extend 4 segments and have some fun. If it warms up the next day, you can take the same rod and line out and actually catch fish with it. We finally got some snow here in the new Tenkara USA home of Boulder, CO. And, with it, some very cold weather. The low tonight is expected to be a chilling 5°F! Salt Lake City, where I was tenkara fishing yesterday, is expecting a low of 18°F. Pittsburgh, PA, will see 32°F, as will Harrisonburg, VA. This cold front has come right when I started reading about the International Didymo Conference. And, since I was travelling and fishing, I was also thinking about the spread of this nasty and invasive species. Didymo, if you’re not yet familiar with it, is a type of algae, also known as “rock snot”, which can spread very quickly and cover rocks on streams and have significant impact on the ecological balance of our favorite waters. It looks like “wet toilet paper” (though not usually white, unless it is getting dry). Its spread is most commonly blamed on our fishing equipment with the most common culprit being wading boots as there are many nooks where the algae can penetrate and then spread (though other equipment such as waders can also help spread it). Felt sole boots, in particular, are seen as the big scapegoat for the spread of didymo since they can remain moist for a long time and the pores can host the microscopic algae. But make no mistake, rubber-soled boots can also carry the stuff. Part of the reason for the Conference, which will happen in March, is to figure out how to best stop the spread of the stuff. There are lots of advisories out there but not yet a silver bullet. The consensus for how we can all help is to clear our equipment thoroughly before going from one stream to another. But, ask 10 anglers the best way to clean the equipment and you may well get 10 different answers. I know this because I have asked at least 10 anglers how they clean their gear. Here is a good list of options. The advise I paid particular attention to came from Ralph and Lisa Cutter, well-renowned anglers and creators of the highly acclaimed Bugs of the Underworld. The Cutters possess what I consider some of the most insightful knowledge of aquatic life, and when they gave me their answer I listened: “freeze it”, they told me. As with anything, if it is not convenient to do, many of us will slack off and not do our part. It turns out, freezing is not only a highly-effective method of cleaning your gear off didymo but it is also a very convenient way of taking care of this mandatory chore. In the warmer months I carry a large plastic trash bag with my fishing gear; at the end of a day of fishing I throw my boots in the plastic bag and as soon as I get home the bag goes straight into my freezer. Pretty easy as I do not have to deal with cleaning solutions and the risk of missing some of the didymo (though it helps if you have a mostly empty, or large freezer). Since hearing this advise I have religiously incorporated this chore into my coming home ritual: jacket on the floor, waders in the first empty space I see in the garage, rod on the couch, and wading boots straight into the freezer. Now that I’m living in “cold country”, and the temperatures are in the freezing territory I decided I’d just throw boots right outside for the night and let nature take care of it for me. If you haven’t done this and were recently fishing, do us all a favor: put your boots out for the night, or if you’re not lucky to be in freezing territory right now (sarcasm here! ), just throw it in the freezer for the night. That should be easy enough. Last year I had the pleasure of meeting Jay Pape at the first Tenkara Summit. Jay works for the National Forest Service out of Bozeman, Montana, and this year I had the opportunity to get to know and fish with him when I was visiting the area. I’m very thankful for his submission of the very helpful article that follows on gear maintenance. Now that snow and ice has closed most of the local streams here in Bozeman, I use the long Montana nights to tie kebari and reflect on the many days enjoyed tenkara fishing this season. dare collapse the tip sections and quickly drove home to let everything thaw out. At this point the harsh realization set in- my season was over for a while and a bit of winter maintenance was in order. Remove the end cap and slide out each section of the rod. I then place them on towel to keep them from rolling onto the floor. With a turkey baster or syringe full of warm water I flush the inside of each section and blow any remaining water out before. When everything is dry I use a clean cloth saturated with denatured alcohol to wipe down each section. This removes the residue on the thicker end and evaporates quickly. Warm soapy water also works well. Before reassembly I inspect the Lillian for damage and lubricate each section with Tri-Flow applied to another lint-free cotton rag or pad. TriFlow is a dry lubricant that repels dust/dirt and isn’t greasy like WD40. When my rod was new, I wanted to keep the cork grip from getting covered with black, sweaty grime. To prevent this, I applied a few coats of Zinsser Clear Shellac. If the shellac looks worn, I add a fresh coat. Once everything is dry, I apply a fresh wrap of white, PTFE (plumbers) tape to help keep the screw cap snug [note from Daniel: the newer tenkara rods have an o-ring on the caps, which prevents them from unscrewing, PTFE tape should not be necessary]. The rod tube also gets a thorough cleaning and the threads are dabbed with Tri-Flow to keep the end caps from binding. To clean the mesh of the tamo I fill the kitchen sink with hot soapy water, soak and rinse. This should be done after every outing to prevent the transport of invasive species. This is also a good time to inspect the net bag and make any needed repairs. Lastly, I wash my smelly waders and boots and let them air dry before storing them in my fishing bin. I also go through all of my lines and replace the tippet rings or perfection loops. With everything put away in good condition I can tie kebari (and ski powder) knowing that I am ready to enjoy the streams as soon as the weather breaks. Back in 2010 I wrote about the Mamushi-kebari, or “the snake-skin tenkara fly”. Mr. Hirata is the person who either invented it or at least became known in tenkara circles for that unique fly, which he ties using the skin of one of Japan’s most venomous snakes, the mamushi. For the first time I’ll be taking the liberty to talk about something that is not totally related to tenkara, but which I think you’ll enjoy, and which may have applications in tenkara too. Do not worry, this will not be setting a precedent for posts about funny cats in the future. I believe you’ll like learning how to turn your camera phone into a microscope. A combination of post-trip lack of inspiration, moving to a new house/office and adopting a new high-energy dog have kept me completely away from writing on this blog. To the readers of this blog, my apologies for not having provided you with recent posts on tenkara. Many of you have written asking for more, and I probably responded I would when inspiration hit. Today I spoke to my grandfather and he told me he missed my posts; that was good motivation to see what I could write about. So, I decided to open my picture album of photos from Japan and see what I could find. 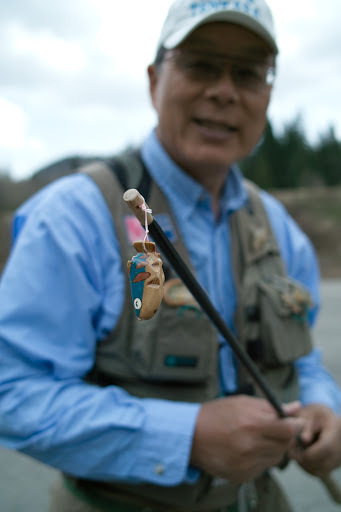 Alas, the first picture of the album is of Dr. Ishigaki showing his fishing rod with a custom built rod plug. This is a great picture for a few reasons. First, several people may lose their rod plug and need a replacement (btw, we do offer replacement parts here). Second, Dr. Ishigaki works closely with a major rod manufacturer in Japan on designing their rods. In such capacity he has access to all spare parts and about as many rods as he wishes. And, even though he’s not a craftsman, he chose the fun route of making his own wooden rod plug. He chose the fun route, and made a small wooden plug by quickly carving a small twig to fit the rod. On top of the plug he drilled a small hole, and attached a small wooden fish he had. Dr. Ishigaki really enjoys starting conversations with others about tenkara. Thus he may use a beautifully carved wooden fly box, line holder and nipper holder and he likes using very exquisite tenkara nets. He knows those items are not necessary for fishing, and he doesn’t need to carry them. However, each and every one of these items provides an opportunity to start a conversation with a stranger, a student, or someone who may have shunned the concept of tenkara. The wooden plug is one of the simplest things to make and add customization and personality to your tenkara gear. Next time you lose yours (hopefully you won’t, by dedicating a pocket specifically for it), see it as an opportunity to carve your own. You can make one in about 5 minutes, or spend an evening making it instead of tying flies. Besides being asked if you broke your rod next time you show up at a stream with your 20″ collapsed tenkara rod, people will sure be intrigued by that wooden plug at the end of your broken rod.